BERLIN, Nov 16 2012 (IPS) - The austerity programmes being rolled out in virtually every member state of the European Union (EU) – particularly in Greece, Portugal, Spain and Italy – have failed to reach their stated objective of consolidating public finances in order to solve sovereign debt crises. Instead, these programmes – which entail massive public spending cuts in sectors such as education, health and governance – are “leading to collective folly” and even to “a social breakdown” across the continent, according to numerous economic experts. Far from solving the debt crisis, as promised, the current fiscal consolidation plans will result in higher debt-GDP ratios in the EU in 2013, according to recent research. Several reports have now confirmed what economists and activists warned months and even years ago: that the economic crisis, triggered by the financial collapse of 2007-2008 and the subsequent state-sponsored bailout of banks and investment funds, has resulted in higher unemployment and poverty rates in every country. According to figures published by the official European statistics office, Eurostat, youth unemployment in Greece, Ireland, Italy, Portugal and Spain is presently above 30 percent. The situation is particularly difficult in Greece, where youth unemployment has more than doubled since 2008, to reach 55.4 percent in 2012. In Spain, where a 37 percent youth unemployment rate was the norm in 2008, the crisis has rendered over 50 percent of the youth labour force jobless. 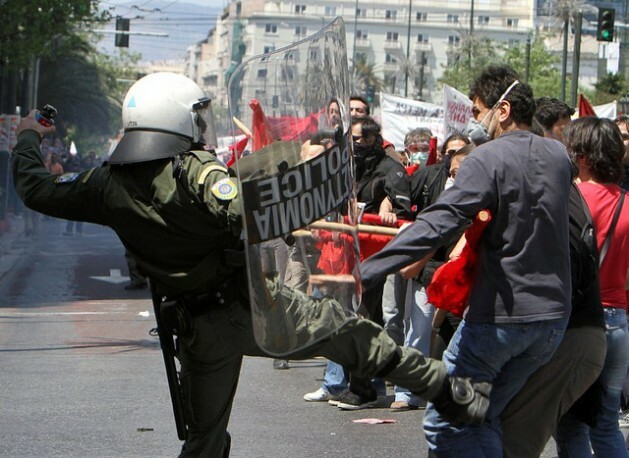 Further deterioration of the social climate in Greece, where unions have orchestrated a wave of general strikes against yet another bout of state budget cuts, this time worth 17 billion dollars, augurs ill for the future of the Union under the shadow of austerity. In its newest Global Prospects Report, released on Nov. 5, the London-based Centre for Economic and Business Research (CEBR) predicts that the Eurozone recession will continue through 2013, with only “marginal growth … likely” in 2014. According to the CEBR, the outlook is particularly calamitous in Greece, Italy, and Spain, with negative economic growth prospects. The report forecasts contractions of gross domestic product (GDP) in all three countries for 2013, of seven, 1.8, and 2.2 percent respectively. Yet another analysis of the economic and social situation in Europe, released Nov. 1 and authored by two leading economists at the London-based National Institute of Economic and Social Research (NIESR), goes even further, arguing that the austerity programmes across the continent are “self-defeating”. The NIESR’s most benign scenario for 2013 forecasts a worsening of the present depression. According to their calculations, the austerity programmes will have a negative impact on the debt-growth ratios of 8.9 percent in Greece, 7.7 percent in Portugal, 4.2 percent in Spain, and 1.9 percent in Italy. According to the study, the youth unemployment rate was 33.6 percent (or 19.5 million people) in 2011, “the lowest level ever recorded in the history of the European Union”. However, there is huge variation between EU member states, with rates varying from below 7 percent in Luxembourg and the Netherlands, to above 17 percent in Bulgaria, Ireland, Italy, and Spain. The drain of an unproductive youth force – in terms of lost output – amounts to some 153 billion euros annually, or 1.2 percent of the EU’s GDP, according to the Eurofound report. Stefano Scarpetta, deputy director for Employment, Labour and Social Affairs at the Organisation for Economic Co-operation and Development (OECD), charged that Europe was “failing in its social contract” with the young, and warned that political disenchantment could reach levels similar to those that sparked the North African uprisings that have been dubbed the Arab Spring. According to a report released last May by the International Labour Organisation (ILO), unemployment among young people in North Africa jumped five percentage points in 2011, to 27.9 percent. “North Africa and the Middle East stand out in terms of their overall unemployment problem and these are the only two regions where the unemployment rate exceeded 10 percent in 2011 for the population aged 15 and above,” according to the ILO. That situation is now true in various EU member states, where discontent has emerged in the form of ‘indignados’ in Spain and mass youth mobilisations in Portugal, Greece, and elsewhere in Southern Europe.